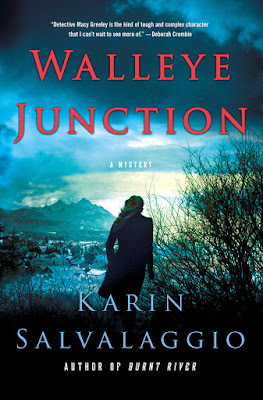 MY BOOK, THE MOVIE: Karin Salvalaggio's "Walleye Junction"
Born in West Virginia and raised in an Air Force family, Karin Salvalaggio grew up on a number of military bases around the United States. Her novels include Bone Dust White, Burnt River, and Walleye Junction. She now lives in London with her two children. Walleye Junction, the third novel in the Macy Greeley mystery series, is set in a rural community in northern Montana. Tucked beneath the majestic peaks of the Whitefish Range, the Flathead Valley is an area of outstanding natural beauty. Given this richly visual material it’s hardly surprising that my readers often ask if my novels will ever be made into films. Unfortunately, I’m still waiting for Hollywood to call, but in the meantime it’s fun to fantasize. I recently sat down with a friend who works in the film industry to discuss who would be ideal to play the various roles in Walleye Junction. It was only after drinking an entire bottle of wine and some serious soul-searching that we agree on a cast list. Hard work but someone has to do it! Macy Greeley, the special investigator central to the series, isn't ever described as attractive yet people are drawn to her. I like to think it boils down to a healthy mix of intelligence, charisma and tenacity. Though I'd originally chosen Jessica Chastain for the role, my girlfriend convinced me that Ruth Wilson (The Affair, Luther) would be the better choice. Emma Long has returned to her hometown Walleye Junction following her father's murder. She is a woman who I'd describe as elegantly detached - even when devastated her actions are carefully contained. We agreed that Elizabeth Debicki (The Night Manager, The Great Gatsby) has the perfect balance of beauty and intelligence to play this role. Ryan Marshall is the top crime scene investigator in the state and one of Macy's closest friends. Every scene she has with Ryan jumps off the page. Their conversations are laced with dark banter and innuendo. Joseph Gordon-Levitt (Inception, The Walk) would be ideal. Matthias Schoenaerts (Rust & Bone, The Bigger Splash) is the only actor who can play Aiden Marsh, a police chief who also happens to be Macy's boyfriend. Be still my beating heart. Nathan Winfrey is Emma's frustrated former boyfriend who longs for the 'glory days' of high school when he was the star quarterback and facing a future full of promise. Now in his early 30s and running his uncle's cherry farm, he's unable to hide his disappointment. Tom Hardy (Mad Max, The Revenant) would bring the right mix of physicality and intensity. The Page 69 Test: Burnt River.